For being blind, this forest has a lot of colors to show. Don't miss out on this one of a kind platformer! Moon Studios – a name you should keep in mind from now on. Being a team of former AAA-developers these people obviously know their craft and love what they are doing: creating awesome games. Their 2nd project “Ori and the Blind Forest” is nothing short of amazing: 4 years in the making, resulting in a meticulously crafted world featuring so many hand-drawn details for the inclined gamer to marvel at. One of the cutscenes in the game. 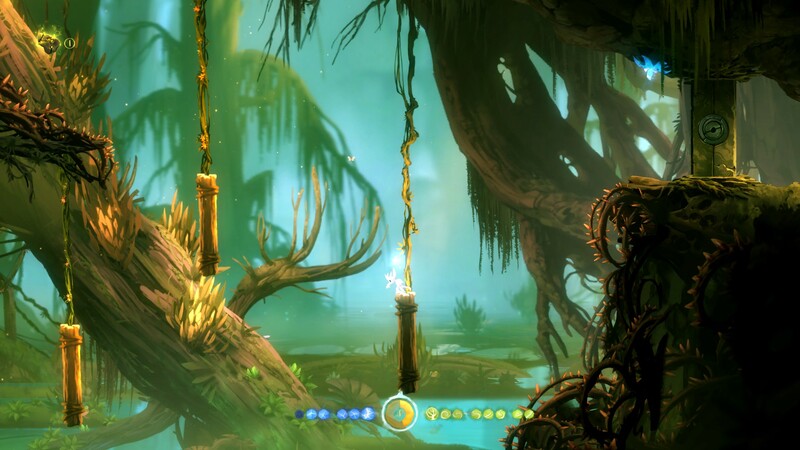 The great use of multiple layers and colors in Ori is unmatched thus far! So yes, let’s cut right to the chase: Same as comparable high-quality indie titles like Super Meat Boy or Transistor, this game is smart, well-crafted and compelling from start to end. If you like hard platformers your will want this game. In the following section I’ll explain why you’ll be thrown into an emotional rollercoaster, torn between carrying on and throwing your controller away as far as you possibly can. It’s a demanding, but also very rewarding game. 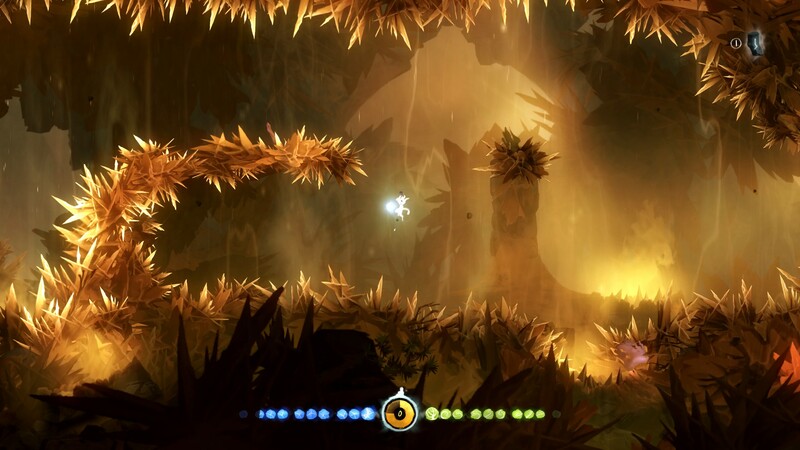 Ori’s world is so detailed that it almost hurts to move by so fast! Take your time to spot little details, it might be more rewarding than you think! The first minutes of Ori throw you right into colorful sceneries and lustrous landscapes, accompanied by an excellent score and narratives driven by a soothing voice – in short: it’s the stuff of which great animes are made of. 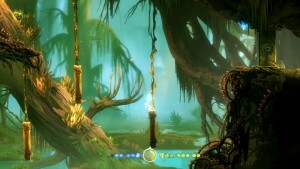 Unlike many other titles you start Ori with an outburst of negative feelings, which is both a rare and welcome sight in modern gaming culture. You also learn about interesting characters that are reminiscent of foreign cultures: many elements of this game, including names such as “Ori” or “Kuro” ooze with ambivalent meanings. This drags on until after you reach the ending, making you think for hours after you put this game down. 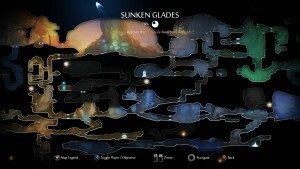 But all this doesn’t mean that Ori is an inaccessible mix of references – far from it. This game is highly accessible, easy to pick up and understand, and it narrows down the main story and motivation to a few simple words. 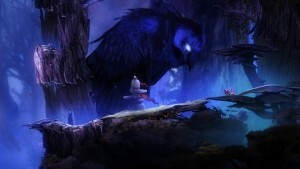 But Ori also doesn’t deny it’s roots: the developers themselves admitted that they took ample lessons from the likes of Metroid, Mario and Castlevania, and they don’t hesitate to show these inspirations in every minute: You gain points by defeating enemies and finding secrets, you unlock new abilities which allow you access to new areas, and the difficulty rises accordingly. At first glance this may reek of artificial inflation of the game via the use of evil backtracking methods, but Moon Studios managed to avoid negative feelings by creating an ‘organic’ world that feels both very natural and enjoyable to run through during every minute of play. As simple as it starts: Later sections in the game will demand high precision and nerves of steel to master! While being beautiful the sceneries of this game can be deceptive as well. This is because Ori inherited another thing platformer games like “Meat Boy”: it’s punishing difficulty. At the start you will get introduced to the game’s mechanics quite gently, but the learning curve will rise soon enough, forcing you to learn and master newly introduced mechanics almost right after you get them. And even if you turn out to be the absolute natural in the genre, you will die – a lot! This game will hold you by its principle, namely “learning by dying”. With that said it’s a good thing that the developer were aware of the difficulty spikes, thus allowing you to quickly set down “spirit flames” which act as both upgrade- and resurrection points. It’s a very elegant approach that strikes the balance between managing flexible save games whilst keeping up the game’s steady pace. It’s up to you to decide if you want to solve the next dangerous obstacle or spend your valuable spirit energy (which is also used for combat and exploration) on another safe-point. As death can literally wait around the next corner, instant revives with no load times always manage to keep you within the action. Enemies in the game are also nothing to scoff at. Many of them move fast, but with predictable patterns. Most projectiles are aimed at you with pinpoint precision and require you to avoid (or later reflect or even re-purpose) the projectiles as they come at you in spades. While being diverse in their approach and looks, it’s a bit sad that enemies get re-used throughout the game as colored stronger versions, but there are enough different foes to keep you engaged and thinking strategically at all times. Thankfully the controls of small and fragile Ori are spot-on, always making you feel responsible for your own actions. 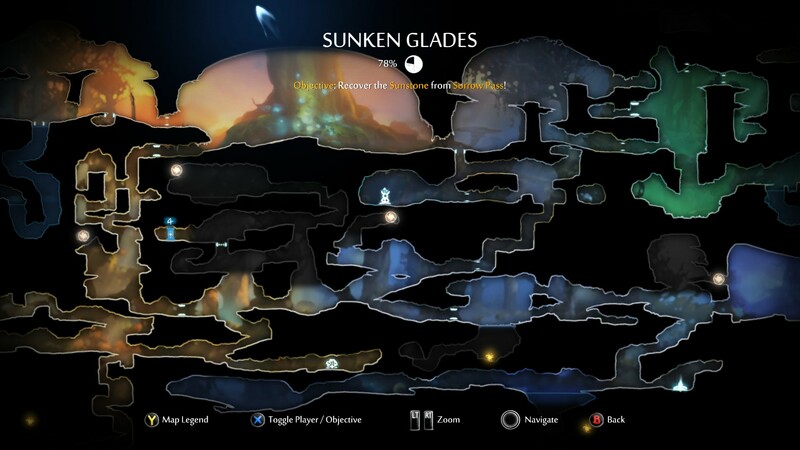 Ori has huge areas to explore, which is a lot of fun once you reach your full set of abilities! Ori features multiple big areas to explore, each with its own thematic setting and distinct design. While some areas are a bit “cliché-driven” – obligatory ice and fire areas come to mind – Moon Studios still managed to seamlessly tie every area together both in terms of loading times and art style-transitions. It also helps that each world is equally as detailed and thematically stunning as the last, making the transitions and exploration feel both interesting, motivating and diverse. To cut it short: there simply are no “boring” areas in this game to be found whatsoever. 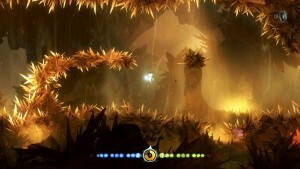 As with any similar “Metroidvania” title you will get more flexible and powerful as you progress through the game. In Ori this power-curve is perfectly balanced, as both new enemies and environments steadily adapt to your capabilities, while existing areas will soon feel like a breeze to roam through. This gives you a feeling of progression and freedom, adding a fun component to the otherwise stale element of backtracking, rendering my points of criticism in that area almost non-valid. Featuring three different “tech-trees” to go through you can freely chose if you want to be better at exploring, defense or offense, potentially alleviating areas that you had problems with. When spending points the game does hardly put restrictions on you, and each tree has his own merits, leaving the choice fully up to you. What are Kuro’s motives? For the most part you will spend your time running away from this menacing gigantic Owl. Ori may ride on the “you are the world’s last hope” cliché, but it’s narrative and design are so well put together that you can’t stop going until the end. It’s a game that’s hard, challenging and even unfair at times, requiring you utmost precision in the later sections of the game, but on the other side you get rewarded with both powerful and fun-to-use mechanics that keep you hanging at your gamepad for hours. Seeing little Ori move with such speed and agility is a rare joy and level of quality that not many comparable games manage to offer. Ori and the Blind Forest is not inventing anything anew, but brings a lot of fresh elements to the table and manages to combine them into nothing short of a masterpiece. The presentation, animation and sound-design are on such a high level that you cannot help but notice that this game is stretching the line between “Indie” and “AAA” gaming developement. I guess it shows that having a big publisher such as Microsoft in their backs sure helped Moon Studios to produce something great while obviously retaining their artistic freedom. 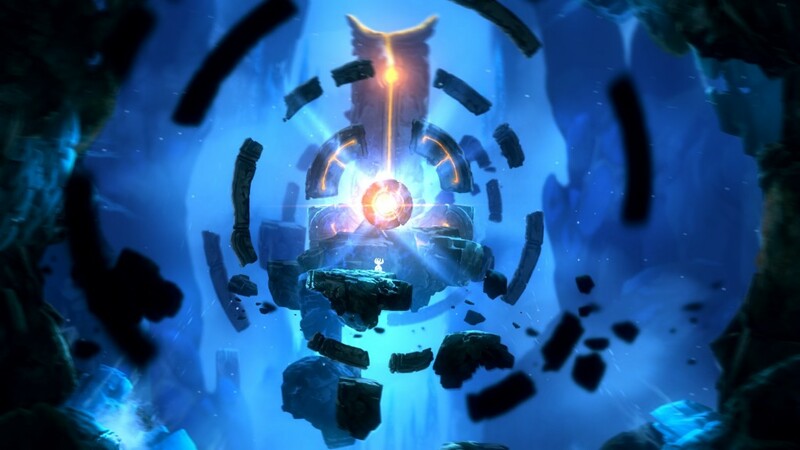 Here’s hoping that they will carry on the light, endowing us with many more games like Ori in the near future!